The Clemson Athletic Department is offering a few reminders to fans attending Saturday’s game between the Tigers and Gamecocks. TV market clearances for stations carrying the noon game are also listed below. Please plan to arrive early. Parking lots open at 6am. To avoid traffic delays, please arrive before 10am. Kickoff is NOON. IPTAY donors with parking placards should also plan on arriving earlier than usual. Overall increase in traffic will impact getting to your reserved lot or street. General public parking is available on campus. Please follow the directions of the South Carolina Highway Patrol. Parking is also available at the YMCA facility on Highway 93 toward Oconee County. There is a small fee for parking at the YMCA. General public motor homes are not allowed to park on campus. Motor home parking is available at the YMCA. Phone number 864-654-9622. Fans attending the game should purchase tickets from people they know. There have been some counterfeit ticket issues at college games in the state this year. Ticket price is $49.00 each. Tickets cannot be sold for over $1.00 of face value. The suite ticket price is $54.00. There are two types of tickets for the game. 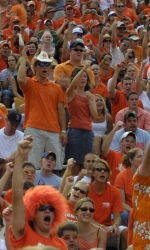 A four color ticket with a picture of the West Zone project is for Clemson season ticket purchasers. An orange bordered ticket with a recessed Tiger Paw is for all individual game sales and Clemson students. There will be a security detail on game day looking for scalping and counterfeit tickets.